Today, like almost every Friday, I drove around going to local Estate and Tag sales. My inventory is plentiful, however, I keep searching in case there is something that would be a great fit for my eBay store. Quite honestly, the price of merchandise being sold at some of these venues equals, or is perhaps greater than, the price I could get for it on eBay. So I am being very picky about what to purchase. However, today something happened at a garage sale that left a bad feeling in my stomach. An older gentleman (probably around 80 years old) wanted to buy some tee shirts and polo shirts. He was trying to get the seller to come down in price for the used clothing. The seller was asking $2 for each tee shirt and $8 for polo shirts. He was obviously annoyed by the older guy’s multiple attempts at bargaining and said to him in an irritated voice, “Well, you don’t like the price on those shirts, but you do like the labels.” This tasteless comment bothered me on multiple levels. First, I believe that you treat people with dignity and respect, even if they are annoying you. I know that senior citizens can sometimes get a little cranky; their mood could be influenced by medication, illness, or dementia. Keeping these things in mind, what made this man believe it was ok to talk to the senior citizen in this condescending way? I don’t know, but it bothered me. No one should be spoken to that way, and where is respect for our elders? Second, we don’t know the financial status of this octogenarian. He could be rolling in the dough trying to hang on to his money; or he could be shopping for his clothing at a garage sale because he relies on social security for income. Even if the senior had money, most are worried about outliving it. At 80, his capacity for generating new income from a career has long passed so as the song says, “hang on to what you got”. So I thought to myself, the seller is much younger and seemingly in good health. He still has time in front of him to generate income. How much would those couple of extra bucks in his pocket impact his life? Annoyed, it was time to cut my browsing short; I no longer wanted to buy anything at this sale. I had a chance to read a bit of your blog last night after we made our deal! I just wanted to tell you that you seem like an extremely nice person… Very caring and I was very impressed by what you had to say. If more people saw your blog… They would probably seek you out, because there are a lot of other people like me that when faced with choices of who to deal with, they’d want to deal with caring sincere and hard-working people like you! I wish there were more people in the world like you. Best of success to you in your venture… You are great to work with, and I will give you a glowing 100% endorsement. It was very nice of Tom to offer me these kind words. And I’m so glad that someone actually reads this blog. Also, my mother would be proud as she repeated the golden rule to me often enough, “Do unto others as you would have others do unto to you.” It is something we all should keep in mind as we go about our day. However, it is also a lesson for those who are in business or trying to make a sale. People will respond to how you treat them. When given a choice between shopping at the store with the ornery personnel or the one with the pleasant personnel, where do you think they will shop? For my very small business, excellent customer service is something taken very seriously. And honestly, it makes me feel good that I am doing the right thing by having integrity when dealing with my customer base. Next…taking Tom’s advice by getting more people to actually read my blog. Have to talk with my sons about this, because, honestly, I don’t have a clue. 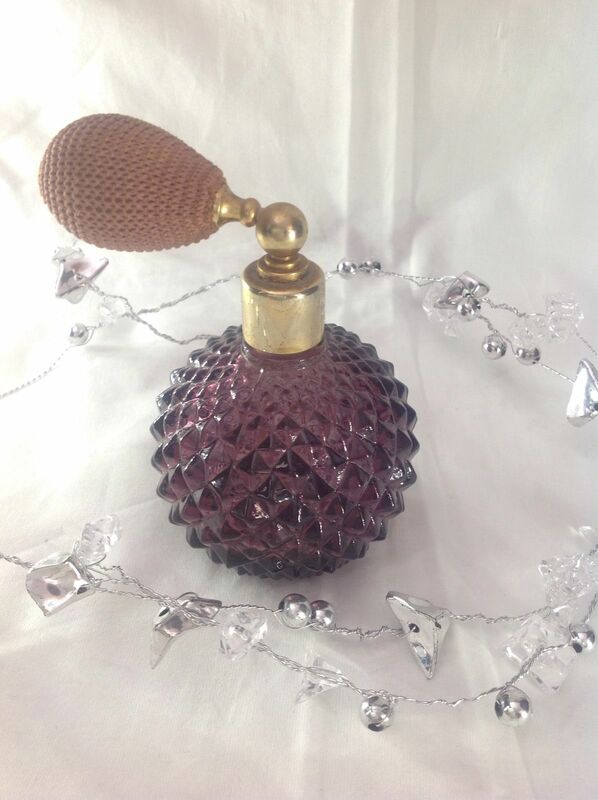 It’s been a year since Linnice Collectibles started up on eBay and we have been reflecting on our experience. This first year has been all about learning. We’ve had to learn what to sell, how to price, how to package and ship our merchandise without breakage, and how to market our brand. It has been an exciting time. We have not seen a profit yet, as all our earnings seem to go back into the business as we try to increase our stock. However, as we go into year two, we may be able to turn that corner. 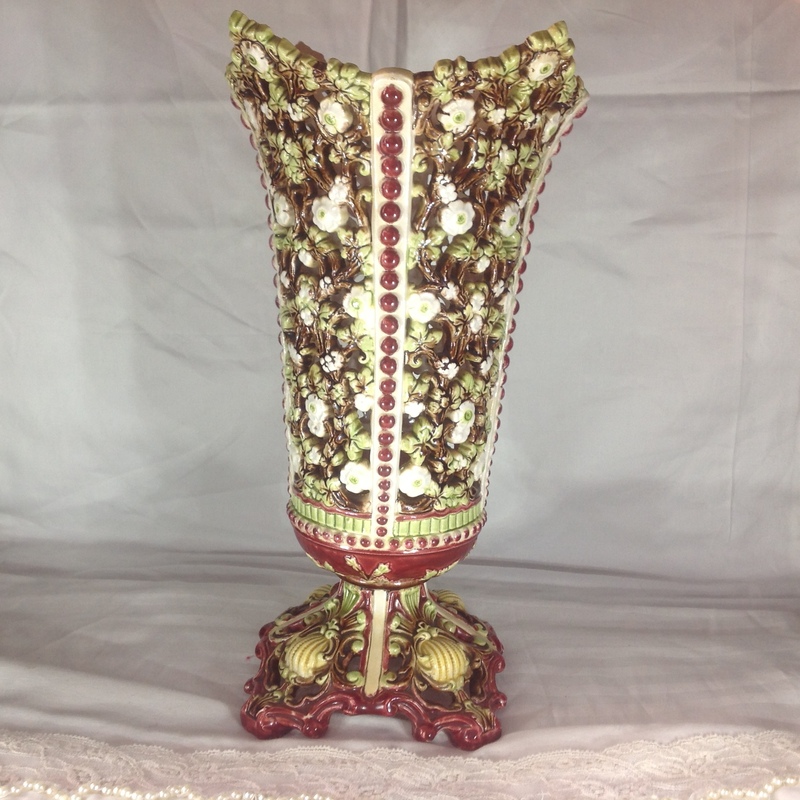 Selling antique and collectible glass and porcelain on eBay is not a straightforward process. Sometimes we list things at reasonable prices and expect it to sell quickly. At other times, we think it will take a while to sell something and it sells immediately. What we have learned is that you never know who is out there and what they are looking for when they are going for a product. So patience has become an important part of the process. Additionally, there is so much competition from others selling the similar items that we have to wait our turn as the listings churn through the massive eBay system. Another challenging aspect to our online selling has been shipping. It took a while to figure out shipping costs. Now that has been complicated yet again with the introduction of dimensional shipping charges by Fed Ex, UPS, and to a lesser extent, the US Post Office. Under dimensional shipping larger packages can be given a minimum weight and that is how it is charged. For example, a package may weight 14 pounds, but if the dimensions are large, you could wind up paying for a 28-pound package. Learned this the hard way when we shipped a large candelabrum to California for almost $80 which because of dimensional shipping. So if customers were complaining about high shipping costs, it will only get worse. Additionally, sellers have to re-evaluate everything they once thought they knew about shipping. In addition to shipping costs, packaging of one of a kind glass and porcelain items presented other challenges. We have learned to package things as if they were going to be delivered by a gorilla. Of course, all that packaging adds weight to the time, which again, increases shipping costs. Shoppers are always asking for us to package the items well and lower shipping costs. Unfortunately, fulfilling one request could cancel out the other. We have found that the United States Post Office offers the best deals for shipping our products at a reasonable cost to our customers. However, there have been times when unforeseen problems come up that are out of our control. For example, last summer we mailed two packages on the same day by Priority Mail. Somehow neither of the packages arrived at their destination (going to two different states). On another occasion a gorilla did indeed deliver a package, shipped Priority. The package arrived to the customer in pieces. We again had to learn through experience. Because Priority Mail comes with insurance, the Post Office paid on the packages, and buyers were reimbursed, we thought all was well. Oh no, eBay holds the seller responsible for the Post Office. The sellers had opened cases saying they never received the package and the item arrived not as described. I think they believed that is how you initiate a return. However, every time a case is opened, the seller gets a defect on their account. Too many defects (more than 2% of total sales) could mean loosing the coveted Top Rated Seller status. When asking eBay why sellers were being held accountable for the Post Office, they said something to the effect that sellers are responsible for the customer’s bad experience on eBay so the seller gets the defect. EBay’s answer made no sense. When it was suggested that EBay assume the responsibility for the shippers because they are endorsed on the eBay site, they clearly did not like that suggestion. Of course, eBay does not want to be responsible for the sellers that they host, the buyers who use their site, or the shippers who they work with. But they do like to collect their fees from us. The bottom line is this, sellers have very few rights on eBay and wind up at the customers mercy. Even when bending over backwards to make the customer happy, if a case is open, there is little recourse for the seller. This is because of the structure set up by eBay. So we have learned that even when we try as hard as we can to keep the customer satisfied and live by the motto the customer is always right, eBay has a one size fits all policy that does not take into consideration individual circumstances or buyer error. This year we also wanted to figure out the Linnice product line. When first starting out, we were going to sell glass and porcelain. However, much of what is sold is determined by what is available on the second hand market. As a result, we are always on the hunt. When finding something interesting at a good price, in good condition, that you think you can sell; you take advantage of an opportunity that may never surface again. Hopefully, this strategy will pay off in the long run as we will always have a great selection of items. We want our store to be an interesting place where shoppers stop by to browse once in a while. If the offerings are stale, there is little reason to come back. Marketing is an important part of the success any business and another area we had to figure out. We are really a garage start up with very little capital, so deciding that best way to market Linnice beyond eBay for no money became necessary. We decided to do it on the cheap by using social media to push our products into other arenas. Thank God for Facebook, Pinterest, and Twitter. Although we cannot determine how much of our sales came from these sites, it was good to see the interest it generated on social media. So in reflecting over the last year, we certainly have learned a lot. We are not the novices we were when we just started out. However, we are not seasoned professionals so we are still increasing our knowledge about the things we sell, how we sell it, and hope that the customers will enjoy their buying experience. It may take several more years for us to get it right but all good things take time to develop. Every so often I am overcome with emotion. When I was a kid, it happened often when watching sad movies and cartoons would have me gushing uncontrollably. It was embarrassing because of the attention it drew; I wound up with a stuffed nose and a huge headache. So I spent a great many years toughening up, trying not to wear my emotions on my sleeve. That worked to a point. Today you won’t find me going to see movies labeled “tear-jerkers” because the last thing I want is to be seen crying in public. It was a melancholy week as the marking of 9/11 always brings back so many sad memories. Yes, I did some crying in the privacy of my home. Everyone remembers where he or she was and what he or she was doing when a tragedy of this magnitude hits. I am no different; like it does every year, it brought me back to my time as a teacher. Theodore Roosevelt High School was a large, comprehensive high school in the Bronx. It began in 1918 as a school located within another school, training secretaries and accountants. By 1928 the school entered its own building on Fordham Road. By the time I went to work at Roosevelt in 1984, gang violence and drugs had ravaged the neighborhood and the school had developed a bad reputation. It consistently made the top ten schools in New York City list for violence. I was not happy when the school district sent me there to work. However, over time my fondness for the school, its students, and faculty grew. It was there that I developed my love for teaching. That same week, a friend and former colleague of mine from Roosevelt contacted me about planning our second annual staff reunion. (Roosevelt was one of the first schools closed during Mayor Bloomberg’s reign of terror on large public high schools.) Quite honestly, my heart wasn’t in to planning the reunion; I guess it was stress from the opening days of school as I still work part time programming a middle/high school. But then I received an unexpected email invitation from the 2R Teddy Bears Retiree group. I excitedly read the email and accepted the invitation for my first retiree luncheon. In reviewing the names of people on the invitation, it became clear that something was stolen from some of us who began working during in the 1980’s. We, the leftover teachers from Theodore Roosevelt High School, were scattered to the four winds. We worked together for many years (over 20 years for me), but our destiny was not to be Roosevelt retirees because they closed the school before we had that opportunity. I loved working at Roosevelt and had always envisioned staying there throughout my teaching career. Our place as “Roosevelt Retirees” was robbed from us. School closings affect not only the neighborhood and alumni, it also affects the staff…those of us who dedicate our lives to a profession working in a school we love. The last ten years were spent teaching in different schools, including, a couple of the Roosevelt replacement schools, Fordham High School for the Arts, Fordham Leadership Academy for Business and Technology, Walton High School, Bronx Academy High School, and Theatre Arts Production Company School. Of these six schools, three were closed by the Bloomberg Administration. Friendships developed in each of these schools, but it was not the same as the experience working at Roosevelt High School. What was it about the school that made it so special? The experience could be summed up as camaraderie. Although we were quite an outspoken bunch, we knew we were working in an over-crowded school with some wonderful but often difficult students. We pulled together as a staff to provide our students with an education. Our collegial relationship reminded me of a quote, “After a while, you’ll discover that though you may not like all of us, you’ll love us in a very special way, the same way we already loved you.” At Roosevelt, we had a way of growing on each other. To this day, I cannot explain why I feel so sentimental and sad about Roosevelt. What do I mourn? Having something taken from me before its time? The unfairness of the situation? The attitude by some in this country toward teachers and unions? The attempt to make it seem as Roosevelt High School never existed…why they even took down the plaque dedicating the Auditorium to our beloved Assistant Principal, Pete Routsis…no more Routsis Hall. Really? The building was there since 1928 with tens of thousands of graduates. Where is the legacy? Gone. Perhaps there was no closure. The year the school closed there was a huge party. They invited everyone they could find, former staff and alumni, to say a fond farewell. Hundreds attended and a vast amount of Roosevelt memorabilia was given away to commemorate the school. People were able to say their good-byes and walk away with a piece of history. I was unable to attend the party because I was recovering from “back to back” surgeries. Some years later, someone brought me an old yearbook from the party; that memorabilia contains fond memories. It is funny how an object can symbolize so much and it is sometimes why people will spend money on antiques and collectibles. 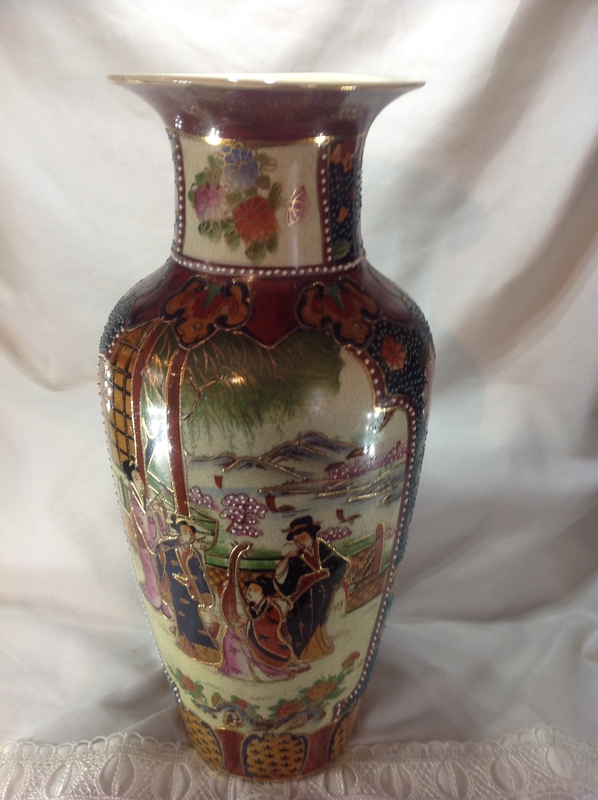 Recently, a person contacted Linnice Collectibles regarding an item that was for sale. 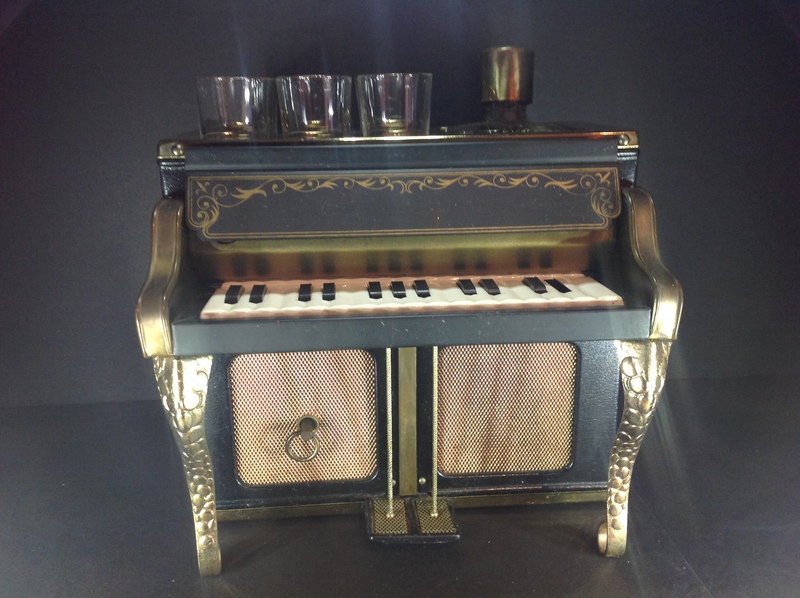 It was a music box that looked like a piano. The person explained that they wanted it because it was similar to something belonging to their grandparents. Apparently, after their grandparents passing, the stepfather proceeded to sell off everything to feed his drug habit leaving little to remember the past. Now the person wanted the music box for a brother who was a piano-player going through hard times. The replacement item was intended to make the brother experience fond memories from their childhood and to lift his spirits. Quite by surprise, I again find myself becoming overwhelmed with emotion as we plan a second reunion that includes the 2R Teddy Bear retirees. This time, however, there are good feelings when remembering so many people with great fondness. We, the leftovers, are going to see a lot of old friends who served as our mentors and taught us a lot by sharing their wisdom when we were early in our careers. “Will non-English-speaking students start speaking English because their teachers were fired? Will children come to school ready to learn because their teachers were fired? Have you every considered what you would do if you became homeless? It could happen in a moment if your home is destroyed by fire, flood, tornado, or hurricane. Or you could see it approaching over time, slowly but inevitably creeping upon you, as you struggle with problems that seem to have no answer. In either case, what would you do? How would you handle it? What would you do with all your stuff? What would you have to give up? Would you have a solid support system to help you? When I was a child growing up in New York City, my experience with the homeless was seeing the “bowery bum”, sitting out on the street corner with a shopping cart containing all his [her] worldly possessions and the occasional dog tied to the cart. They frightened me. They were dirty, dressed in rags and smelled bad; I just wanted them to go away. After becoming a teacher, it became apparent that homelessness was not reserved to the “bowery bum”; families could be homeless too. It was issue that touched my life tangentially, and one, that I did not put much thought into. But that has changed. A cousin of mine is homeless for some time relying on people she knows to put her up for a while, another friend is concerned where her family will live while facing the foreclosure of her family home, and an acquaintance of ours, a young man with his dog has set up tent in our backyard due to homelessness. I have always thought of homelessness, as something that happened to people I don’t know and believed that it was their fault for the situation. That lack of compassion really didn’t take into account the desperation that occurs when people face the loss of a loved one [breadwinner], job loss, domestic violence, divorce, family disputes, depression, mental illness, PSTD, physical disability, substance abuse, or a combination of the above. For those without a strong personal support system, there are emergency shelters and social services in place to help them re-build the economic resources to return to a normal life. Not everyone takes advantage of these services. My cousin and the young aquaintance have not taken advantage of social services in spite of the fact that they have weak support systems. Although the circumstances that brought their lives to this point are different, they share a similarity that compounds the problem…they are dog owners. Perhaps the non-pet owner would consider this a no-brainer; get rid of the dog! However, for them the thought of giving up their dog would be the equivalent of giving up a child. Their dog is their family and only a few homeless shelters will accommodate a pet. So, just for today, I will express gratefulness for what I do have in my life and for the lessons that are being learned along life’s journey. Part of that journey involves the business of Linnice Collectibles. Entrepreneurship is difficult because you don’t know how much money you will make; it is not a steady income. A new business takes a while to turn a profit. Because of these uncertainties, small business owners often lament the taxes they pay the government. The appeal of the Republican Party, which promises to help business grow by lowering taxes, can be great. However, these promises are usually pitted against Democratic policies that would benefit society’s weakest. As the business grows, I must always remember that it is a privilege to be a business owner. Taxes are what I willingly give the government in exchange for a better society for all. We cannot forget those in the greatest need. Is it Knowledge, Luck, Reputation? In looking at the photo, I could only think, who would buy that doll? It looked like the Scarecrow from the Wizard of OZ with the straw pulled out from him. I would have definitely taken a pass on it. But my husband’s friend, Morgan, an eBay Gold Star Plus Powerseller, purchased the doll for about 50 cents. What happened next was unimaginable. Morgan, is actually the person who gave me the idea to sell antiques and collectibles on eBay. After hearing about his success, he was an inspiration for what could be. He usually starts his auctions at $ .99 and bidding quickly drives up the final sell price of his merchandise. What happened with the doll, however, would haunt my dreams at night and take over my thoughts during the day. I became obsessed. Why? 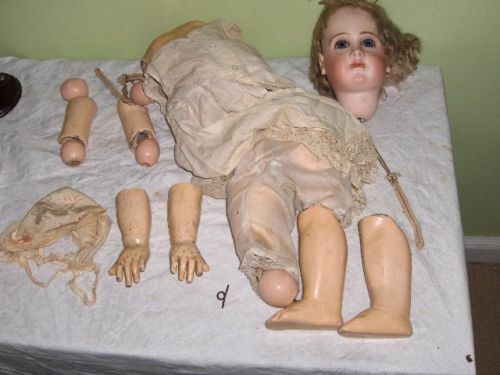 But this doll is in pieces!?! The final selling price for Bebe Jumeau was $16,600. Shocked and awed by the sale, my thoughts were racing. Where does he find the merchandise? How does he know so much? Is this the luckiest guy or what? How can I do this myself? I decided to use Morgan as a role model to see if his formula could work for me. Having found a couple of Zippo lighters at a reasonable price for resale, an experiment was in order. Knowing that Morgan frequently sells Zippo lighters, I created a “test” auction following his time-proven strategies. Unfortunately, after 5 days at auction for $ .99, and not one bid, I conceded it would not work for me. I gave up, offered to give the lighters to Morgan knowing that he would get a good priced for them. He said, no thanks, just list the items and forget about them until they sell. He offered conciliatory words that he is a power seller with a stellar reputation. I guess I am where he was at one time, new, unproven, novice. However, his words made me realize that even if I had purchased the Bebe Jumeau, it would have sold for far less. I have a beginner’s track record and need to be patient as my business and reputation grows. Hopefully, with knowledge, reputation, patience, and a lot of luck, I will one day have my own Bebe Jumeau. And Morgan, imitation is the highest form of flattery. Today was my father’s birthday, he would have been 106 years old, wow. Happy Birthday, Dad! My father was an entrepreneur; he always worked for himself, first as a barber, later as a beautician, then back to being a barber. It was an honorable profession; he paid the bills, put his children through college, and bought a house, etc. Our family was able to live a decent middle class lifestyle. I don’t think there ever was a day when he felt embarrassed by what he did. No regrets. So as I have been exercising my entrepreneurial spirit, something happened this week that made me feel embarrassed by what I was doing. It is no secret that Linnice Collectibles has to hunt for their products at garage sales, flea markets, thrift shops, estate sales, etc. To earn a profit, the old adage buy low, sell high is true as it is for any business. Additionally, this business sells luxury items, not toilet paper. So it is not like people are flocking to our eBay store to purchase our products on the basis of need. Instead, they used their discretionary income (if they are lucky enough to have it), to purchase the treasures we find. So for us, the price at which we purchase a treasure is important if we are ever to make a profit. I don’t know why the label dealers made me feel so embarrassed. Perhaps it was the intonation of the woman’s voice, or the term being used when referring to “drug dealers” or “wheeler-dealers”, but it bothered me. Bernice, always quick with a very polite comeback, said, “Yes, we know the money goes to the church. And that is one of the reasons why we like to come here, because our purchases go toward a good cause. But everyone has to earn a living; it is hard out there today and we have limited funds. So if we are looking to buy things at a good price so we can earn a profit, it becomes a win-win situation.” Thank you Bernice. The woman immediately changed her tone with us. Bernice’s statement made me realize that even as a dealer, I can hold my head up high. We are not wheeler-dealers trying to chisel unsuspecting people out of their property, we are just trying to turn a profit, which by the way, hasn’t happened yet as we continue to grow our inventory. That incident aside, we are actually more than just dealers. Our next outing brought us to the estate sale of a woman who has a 23-year-olf downs syndrome daughter and who just lost two of her parents. She is struggling to help her daughter find a place to work. Her parents died within two months of one another. How do we know this? We know this because we are friendly, compassionate and converse with people. We are parents ourselves, have children with special needs, and parents who have passed on. As we were leaving the estate sale, the woman said how nice it was to meet and talk with us. The world had become a better place as we shared our humanity. So, today, as I remember my father and think about how his entrepreneurial spirit has reached out to me, I am never going to feel bad about what I have chosen to do in my retirement years. Somehow, I don’t think I will ever really like being referred to as a “dealer”, but Bernice has given me the words to use for those who look at dealers with disdain. However, in my heart, I know we are more than that. I hope our humanity continues to shine through as we continue in our new business venture. Linnice as a Rescue for Antiques and Collectibles. One of the nice things about having an antique and collectibles business is that for a time, I am able to be in the possession of some very nice, interesting pieces. Since I no longer keep much of a personal collection, the inventory becomes a transitory part of the collection. It feels as if the pieces are being rescued for a while until a more permanent home can be found. Also, it provides me with an opportunity to include a more eclectic variety of items that would never had made it into the personal collection. The Stormville Antique Show and Flea Market was not as remembered; there was a little disappointed to find it was half the size as was expected. That being said, the flea market offered lots of old things to browse. Lessons learned that day included, take your time. When someone offers a good deal, it is for an undisclosed reason. Stop, think, and look for that reason. As newbies to the business we found that our online prices were certainly more competitive than what we found at vendor tables. Additionally, vendors aren’t necessarily experts in what they sell. One woman had a piece of porcelain on her table with a sign saying, Limoges. When I picked up the piece it said, Made in Bavaria. So I said, well guess it’s not Limoges or it would be made in France. The women obviously didn’t like my comment and said, Limoges is a factory, and they were in many countries. Ok. So I double checked my knowledge of Limoges when I got home. Wikipedia states: Limoges porcelain designates hard-paste porcelain produced by factories near the city of Limoges, France beginning in the late 18th century, but does not refer to a particular manufacturer. Go figure. Twenty-five years ago I fell in love with collectible depression, carnival, and Vaseline glass. After marrying my second husband, Philip, my new family introduced me to the world of collecting. Each week, my sister-in-law, Mary, and I would visit garage sales, estate sales, flea market, and antique shows to hunt for treasures. The dream was for Mary and I to one day open an antique store with these items after we retired from our “real” jobs. One of the first things we purchased were the Stangl Rooster and Hen, which were picked up at a garage sale in Yonkers. The little Italian lady who was having the sale looked like she couldn’t wait to unload the pair as they didn’t seem to fit her taste. I had a hunch about these two birds, even though at the time I couldn’t get how anyone would want to collect barnyard birds. Unfortunately, our dream of opening a shop would never become a reality due to Mary’s untimely passing. Then, when I retired last year, I thought back to our dream saddened again by the thought. However, in realizing how e-commerce has changed how businesses sell, it dawned on me that it could happen in a different venue on eBay. So last month, Lennice Collectibles opened as a new eBay store. EBay permits new businesses to list 150 items to prove themselves. So the Stangl Rooster and Hen were included in the first 150 items. It turned out that they were desirable to Stangl collectors as they were in a rare color and signed by a popular artist. They wound up being the top seller for our first month in business. For me the Stangl Rooster and Hen are past, present and future. They represent fond memories of time spent with my sister-in-law, Mary; the beginning of the new venture with eBay today, and the hope of one day earning a profit.